I enjoyed this book much more than the first. While the first was great, this one was less predictable and there was more explanation about the world in which the story is set. This definite dystopia asks a lot of questions from its readers about the nature of reality, how technology can deceive reality and how dreams and the real intersect. Highly thought-provoking, I would recommend reading this title for the paradoxes of technology and science, creator and controller, futuristic past and the ruins of the future. Werlin, Nancy (2005). Double Helix. Penguin. 250 pages. It has been a long time since I have read any book labelled a “mystery”. 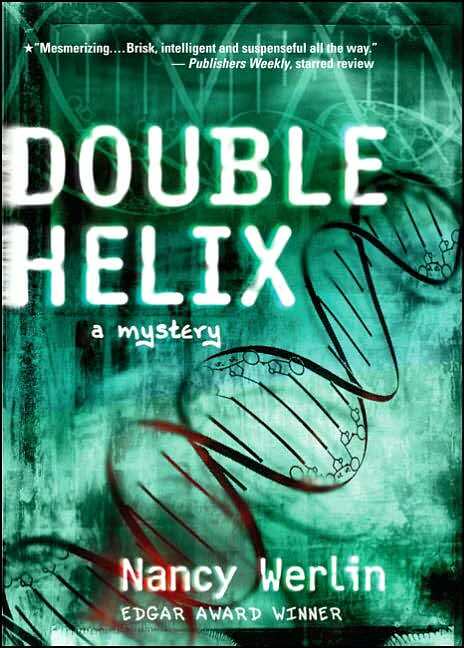 Nancy Werlin’s Double Helix is a mystery as Eli–brilliant, athletic Eli–on the verge of high school graduation loses his mother to Huntington’s Disease. Questioning his own chances of inheriting the degenerative disease, he asks for a job at Wyatt Transgenics in hopes of understanding his mother’s relationship with the genius Dr. Wyatt. Not only does Eli discover the nature of their relationship, but he discovers his own nature, how he can live despite his mother’s genetic failings, and how Dr. Wyatt puppeteered these events in Eli’s life. Immediately: this book takes place in Cambridge, MA; this fact delights me. I thoroughly enjoy being able to envision the setting of a novel in real geographical terms. The fact that there multitudes of private labs and technology companies surrounding MIT and Harvard in Cambridge pushes the events of Double Helix into the realm of the possible. The science and genetics explained in the novel seem very and highly plausible (especially to the non-science-minded). Why wouldn’t scientists be able to isolate specific genes, alter them and prevent diseases? Why would the creation of chimeras be beyond current-day science? Ethically, this novel could pose very heated debates. Using gentics to prevent and cure diseases seems like a noble cause, but where do we draw the line in this type of research? When do the disposal of “waste products” become unethical and even inhumane? This novel immediately launched my brain into a series of questions, some which I very kindly suggested for you above. The technology for the events in this novel is available, and who can say that such events have not ALREADY transpired at some point, some where in the world. The genetic possibilities and social implications that Werlin presents in this novel are truly disturbing because of its possibility that it could happen NOW. Much science fiction, like Nancy Farmer’s House of the Scorpion also creates a novel based around eugenics; however, Farmer’s novel is CLEARLY SET IN THE FUTURE (which is emphasized by the presence of hovercars and an 140 year old man who created several clones of himself). In order to lure young adults into exploring this science fictive mystery, it might be fun to suggest that the very popular, athletic and smart student–you can even ask for a name (for the sake of example, we’ll call her Angela)–may not be exactly…natural. Is Angela good at basketball without trying? Does she bother studying for tests? Does she have great skin and hair? These students of seeming perfection exist in high schools, engage potential readers in the topic of eugenics by alluding to the possibilities of being genetically enhanced before birth. What if we could all have perfect skin, brains and athletic prowress? What does that do to social hierarchy? This is the perfect novel to delve into the possibilities of biotechnology.